There is a fair chance that at some point, the electrics in a property will go wrong. Most things deteriorate over time, and electrics are no exception. There are a number of reasons why something might go wrong; excessive electrical loading, ageing, every day wear and tear, environmental influences and corrosion can all affect when wiring and electrical items go wrong. In most cases faulty electrics will usually cause inconvenience but sometimes, especially in older properties, electrical faults can be immediately dangerous and should be inspected by a qualified electrician without delay. 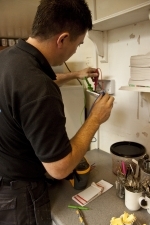 PGS Electricians can troubleshoot electrical faults and apply repairs as required. Call us for more information. It is not always easy to identify where electrical problems lie, and in some cases, all that may be obvious is that there is a problem somewhere in the system. Sockets may appear to stop working, lights can dim and flicker, and there could be discolouration or scorch marks around some of the outlets. These are all signs that the electrics in your house require maintenance. It’s vital if something isn’t working that the problem is fixed quickly and professionally, as although the problem could be something minor, faulty wiring causes a huge number of fires every year, potentially risking your life and property. PGS can provide a trained eye to look at the situation and locate the cause of the problem and apply the required fix. Sometimes these issues are down to faulty appliances, and others down to circuit breakers, overloaded electrical circuits, worn out components or outdated wiring within a house. We can fix the problem, and fully certify our work, giving you the peace of mind that any work done is safe and guaranteed. Regular maintenance on your home’s electrics is important to make sure they are safe, installed correctly and meeting with building regulations. PGS have approved electricians who can not only install equipment, but carry out the necessary tests and reports that prove it is safe and up to standard.